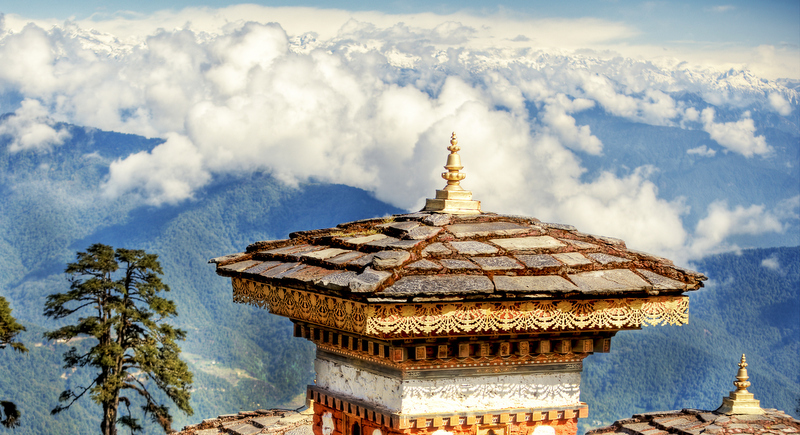 The opportunity to visit Bhutan is rare and tantalising prospect, the Himalayan kingdom still remains somewhat mysterious to outsiders, it is perhaps best known for measuring its prosperity in Gross National Happiness rather than in economic terms. 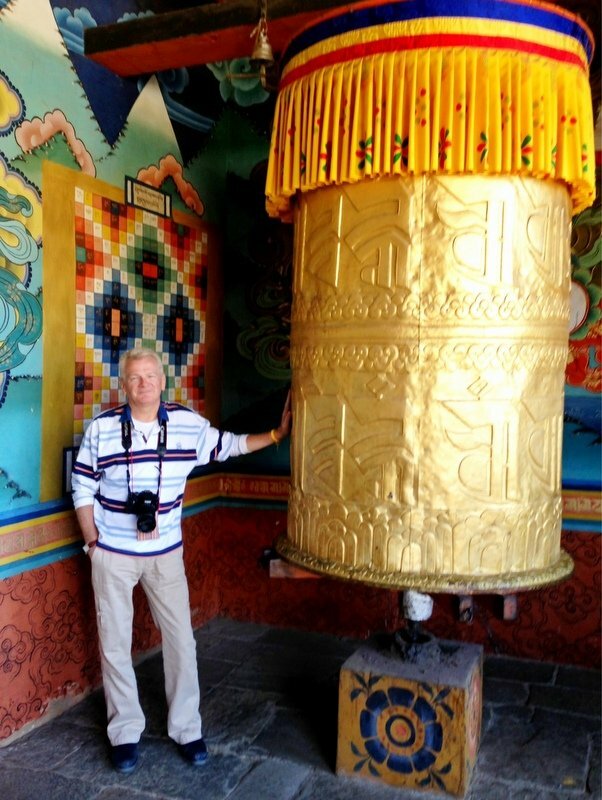 The author dwarfed by a massive prayer wheel at the entrance to the Punakha Dzong. Visitors to Bhutan must pay a government stipulated daily fee of US$250 (B8,700) which covers your accommodation and guide for the duration of your visit. The country receives only about 130,000 visitors a year, so compared to somewhere like Thailand it seems virtually untouched by tourism. We arrived at the capital on a direct flight from Bangkok with a plan of taking in some of the countries most famous landmarks. Particularity the Punakha Dzong, an ancient fortress constructed in the unique and imposing Bhutanese architectural style. Our first stop after leaving the capital Thimphu, on the journey east, was Dochula Pass at 10,500 feet or approximately 3,000 metres. At the pass we reached our highest point of the day, down here on the valley floor, although lower, I still had to catch my breath. You really started to notice the air was thinner. We hiked to Chimi Llakhang in Punakha. It is a temple dedicated to the 15th century figure known as the divine mad monk. The locals go there to receive blessings of fertility. We hiked about three kilometres through fields and empty rice paddies – our objective lay ahead, on a rise in a landscape dotted with small holdings and fields and streams. It was a mild day – bright, clear and warm in the sun rays, but with a crispness that comes with altitude and cool air. The ground and air were bone dry – this was winter and water was plentiful in the brooks and streams, but there was no rain and no humidity. The temple’s golden apex glittered in the bright morning sunlight as we traversed the fields and followed a small brook that flowed swiftly through the green and brown dirt fields and now empty rice paddies. The water was clear and ice cold. Temperatures drop to -5°C and lower at night. 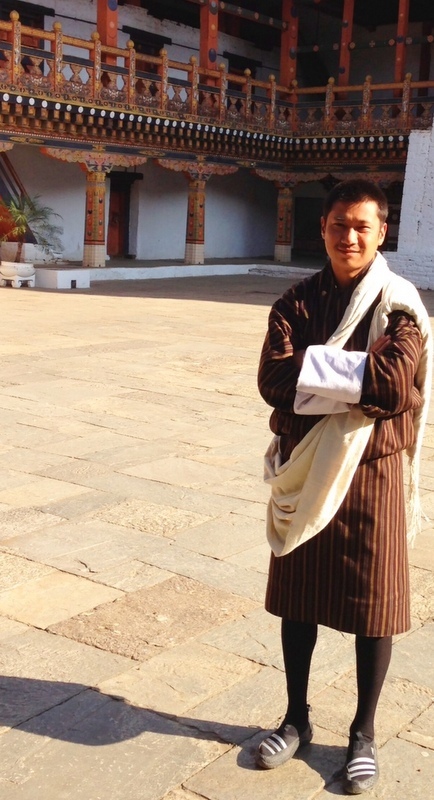 The temple is dedicated to one of Bhutan’s more colourful characters. He was actually Tibetan and not a monk, but a devote Buddhist who somewhat contradictorily had a reputation as a womaniser and also enjoyed a tipple or two. On the hike to the temple we passed many young women with babies wrapped in blankets who were carried snuggly in their mother’s arms or across their backs. They were on the way to the temple to give thanks and to make an offering to the image of the Tibetan for having been blessed with a child. It’s a short step from womanising to being a symbol and a celebration of fertility. Culturally it’s easier to swallow, being a more user friendly image for the guide books. The locals, however, clearly believe the monk even today could help them to conceive. Phallic symbols adorn buildings everywhere in the village en route to the temple and are even sold in the village shop. The monks in the temple also tap you on the head with a wooden phallus and a replica of the mad monk’s bow and arrow (according to folklore, he rid the village of witches and fierce dogs). Before you leave, the monk blesses you with holy water made with saffron which turns the water yellow, a symbolic gesture to all visitors which makes the journey to reach the divine monk’s temple even more satisfying. We also visited the Punakha Dzong. 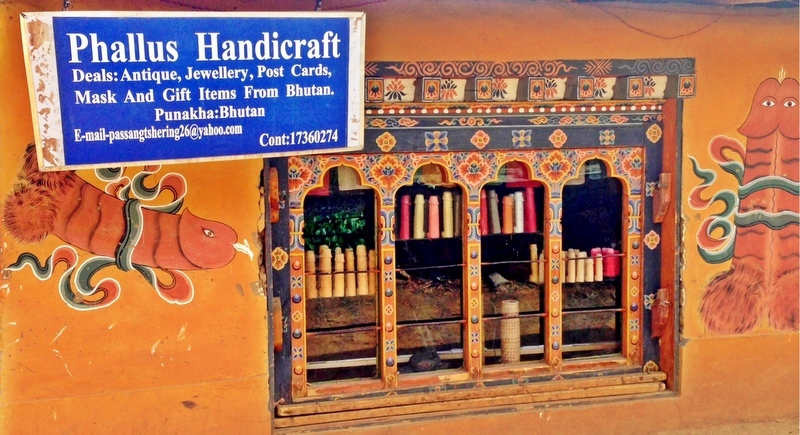 A gorgeous building built in the typical Bhutanese style. The sun casts breath-taking light on the Dzong and the adjacent canter-lever bridge spanning the river. The Dzong dominates the valley floor. Before Thimphu was made the capital of Bhutan, Punakha held the title as winter capital because of its more temperate climate. 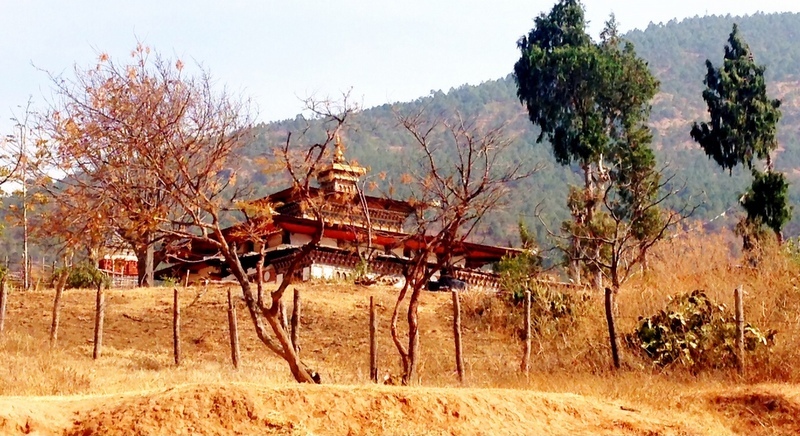 Thimphu’s monks and the Je Khenpo (leader of Bhutan’s religious order) still come to Punakha to pass the winter and the Dzong is home to hundreds of monks. 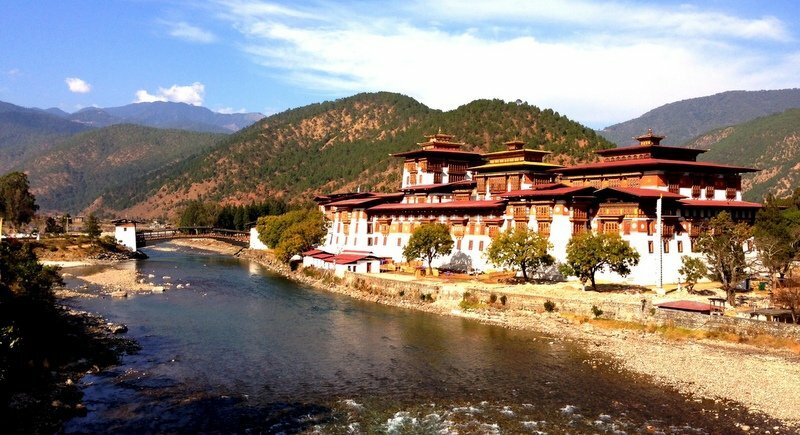 Punakha Dzong was strategically built at the confluence of the Pho Chu (male) and Mo Chu (Female) rivers by the first Shabdrung Ngawang Namgyal of Bhutan, in 1637. It has been destroyed by four fires and an earthquake in 1897 and has frequently been devastated by flood water coming from the great northern glaciers. The Dzong has now been fully restored to its original splendour. 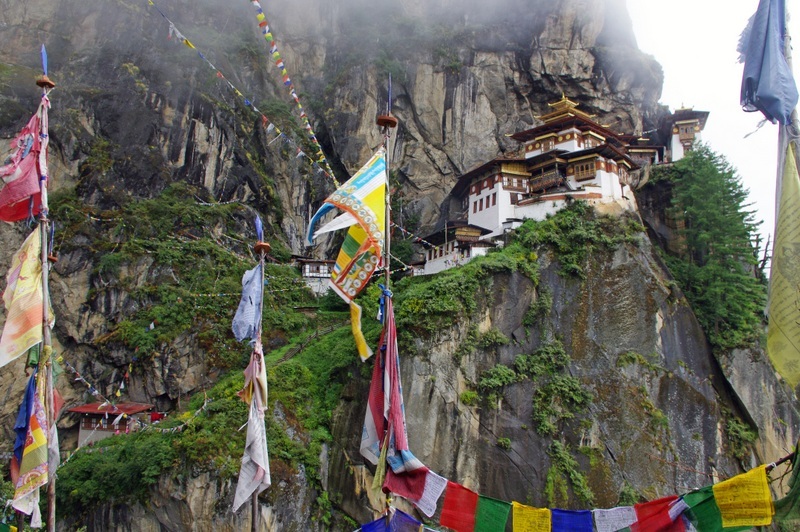 It is magnificent and a “must see” on your visit to Bhutan. The trip was a fascinating but all too short look at this amazingly beautiful and remote country and I hope to return one day to discover more of its wonderfully ornate buildings and breathtaking mountain landscapes.